Vanilla of the World: Online sale of vanilla from Madagascar, vanilla from Tahiti, vanilla from the world of top quality, vanilla very black with a long perfume in mouth. The top of the range of the vanilla. Sale of vanilla of traditional conditioning in a vial of 2 pods in the economic format, for a vanilla pod not expensive but high quality; we import a particular care in the purchase and sale of our vanilla pods. Purchase of vanilla of quality at the best price. 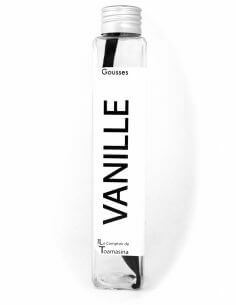 Goldsmith in vanilla, i attaches to search for and discover for you, the best plantations, the best preparers of gousse vanille Madagascar, Tahiti and Mexico and of the Amazon from 2017. I sell only the best vanilla from each country, the best vanilla pods, of pods with a perfume end, persistent and pleasant. But especially toes vanilla who have a history. We have the same process for the whole of our épices, poivres, thés, natural extracts. The Comptoir de Toamasina lance l'univers de la vanille. It is a selection of vanilla of very high quality, selected with the greatest care from the producers. Premises in Madagascar for Flora (seen on television, in Thalassa on France3 "Destination Vanille" to Tahiti to the Vanilla Tahaa, Mexico and soon theAmazon. The vanilla is a spice with aromas very fruity and suave. The vanilla is the outcome of an orchid to be more precise the vanillier, planofolia for the vanilla of Mexico, India, Uganda for example Planifolia AOC Bourbon to Madagascar, island of the meeting, Mauritius., Tahitian to Tahiti and Pompona for Guadeloupe and Martinique. The vanillier is a tropical plant, it was discovered in 1518 by Christopher Columbus in Mexico. The vanillier need need to push in a warm and humid in the shelter of the direct light from the sun. The vanilla and his flower of vanilla grows only in a soft light, in the under wood. The fertilization of the flower of Vanilla is carried out at the Hand between 10h00 and 12h00. Because there is only a bee that can make the pollination of the vanilla it is called the Mélipona. The Colibri can also make the pollination. The reportage of Thalassa shows how to make the pollination of the flower of vmill rind with our producer of vanilla. The fruit of the vanillier presents itself in long green pods, large fleshy ,. When the green pod arrives at maturity, our producer, will the harvest and will then be scalded, dried, sorted and refined. Therefining of the vanilla is the last step in particular for the black vanilla from Madagascar AOC Gourmet, because it guarantees a scent of vanilla sweet and intense for udo vanilla which will be long and very perfumed in the mouth. The Comptoir de Toamasina, it is first of all a family company creates by Arnaud Sion the 5 March 2010. The purpose of the society is to work directly with producers of vanilla, in a first with Madagascar then we have developed other origins with the entry of Danielle Zion (his mother) in the business. You can buy today of the vanilla from Tahiti, of Mexico, Madagascar called Vanilla Bourbon and soon of the Amazon. Since November 2015, our society is Franco-Brazilian with the development of a subsidiary to Belo Horizonte. We are to announce to you that we are the sole importer of vanilla in this city of 2 million inhabitants and of the State of Minas Gerais. We are the sole importer of vanilla 100% natural of high quality in Brazil. Buy from the vanilla pod at the counter of Toamasina, it is to buy a vanilla with a ppolicy of irreproachable quality, with a fair price. Our prices are calculated at the best to remunerate fairly the whole of the wireline and offer you a quality report unbeatable price. The Comptoir de Toamasina in its category The world of the vanilla markets only of the Black Vanilla recognized for its excellence, the whole of our Gousses of vanilla are soft, flexible, black, fleshy, shiny, perfumed, fluffy and not split. The counter of Toamasina offers a choice of single vanilla with a scent of vanilla a exquisite finesse to discover on all our varieties. The Comptoir de Toamasina is in direct relationship with the best producers in the world. The Comptoir de Toamasina commercializes the vanilla 100% natural, without some chemical products nor conservative. The Comptoir de Toamasina is the guarantor of a mode of culture of the vanilla orchid respectful of the environment and of men. The Comptoir de Toamasina vouches that during the selection of the best pods of Madagascar, Tahiti and the World, that our vanilla offers the best organoleptic qualities. The Comptoir de Toamasina undertakes that the vanilla pod for a good preparation, scalding drying , sun and shade, sorts and an optimal conditioning in order to preserve the aromas of vanilla so that VOs delicious recipes are perfect. The Comptoir de Toamasina undertakes to perfect traceability of its lots of vanilla. The whole of our clients are very satisfied with our vanilla. Our customers Partners Since our beginnings Michael Brassart Pastry Chef in Bailleul, Renato Quintino Belo Horizonte chef and culinary critical, la confiserie in Belo Horizonte best handmade chocolate of Belo Horizonte. You also, give your opinion, on our vanilla, in opinion. Sale of vanilla from Madagascar imported directly of the best plantations of Ile vanilla. We are working with notre producteur partenaire in the region of Mananra-north and also in the region of Sambava. We select and we sell the best vanilla pod of Madagascar and only in its quality gourmet/extra. The vanilla pod of Madagascar is a little princess, it is the most known in the world and that the whole of the pastry chefs in the world is torn off. Our vanilla pods of Madagascar are shiny, flexible, a delicate fragrance with notes of cocoa. The price of the vanilla 2016 of Madagascar is in constant increase in the problems of stolen and instability on the Big Island. Specificity of the vanilla from Madagascar: Madagascar vanilla is the most well-known of the vanilla pods in the world. Madagascar is the main exporter vanilla in the world. You will discover a fine vanilla and strong in taste. The latter will have a taste of cocoa. Why the vanilla from Madagascar is thin and long unlike the vanilla from Tahiti. Because the vanilla from Madagascar undergoes a scald which will produce a chemical process which will make the black vanilla. Subsequently it will be dried in the sun. The vanilla from Tahiti is a hybrid vanilla. We can say that it is simply a crossing between the Vanilla planifolia and the pompona. It is called Vanilla tahitensis. It is the only species that product of the vanilla to Tahiti. You will find the same foot to Bora Bora and on the island Tahaa or we buy our vanilla pod of Tahiti. This vanilla is very often with award-winning a médaille of gold in the lounge of the agriculture of Paris in 2013 and 2015 in particular. We only sell the Black Vanilla tahitensis gourmet, quality Extra and Grand Cru. The vanilla from Tahiti is the most prestigious of pods in the world. This is the treasure of the French Polynesia. The vanilla from Tahiti is deemed to be the best, the most exquisite of vanilla in the world. The vanilla from Tahiti is unique because very long in the mouth. It is a product of exception with pods of vanilla very fat, very oily, dress wrinkled, very shiny with a perfume intoxicating. Great vanilla pod, direct from the producer and not expensive. That is the vanilla that proposes the counter of Toamasina. We buy and sell only the best pod of each plantations that we visit. The best report quality MARKET PRICES, thanks to our proximity with the producer partners. Buy a vanilla at a fair price and confidence at the counter of Toamasina. The counter of Toamasina and its creator Arnaud Zion grantit you the price just when your purchase of vanilla in the line. The counter of Toamasina launches the strategy of the win-win to the producer and the consumer on the whole of our vanilla Very High range. The best vanilla sold in Europe. The price of the vanilla flaming, for the best quality of vanilla. The counter of Toamasina will always propose the best pods of vanilla, in particular for Flora or our other producer partners. The global demand is on the rise, Brazil and China buy much more of vanilla. The trend of the market of the vanilla is haussiére for the vanilla 2016. The price of the vanilla is in constant is changing every month, the price of the vanilla will be reviewed each month. We take the commitment of reflected the decline as soon as we are seeing a, come and buy a vanilla the price of the most fair and exceptional quality. The best quality in the world at the counter of Toamasina. The counter of Toamasina book the vanilla in less than 48h00 everywhere in France. The best delivery time of vendors of vanilla. The eurovanilla, the counter of Toamasina is theeurovanille or mondevanille, because we deliver anywhere in Europe in 72h00 after receipt of payment and in the world in 5 to 10 working days. The delay will depend in particular on the customs of each country. Vanilla pod of high quality, because we are the sole specialist in the Vanilla who has a business in France and Brazil. Expert in Import-Export of vanilla between Madagascar and France and then between France and Brazil. Vanilla pod delicious, long in the mouth, fleshy, shiny, loaded in seeds and a great finesse thanks to its perfume, an asset for your preparations. We will introduce you to the vanilla pod of Madagascar Current 2017 November. To retain at best your vanilla from Madagascar or of Tahiti, I advice you to leave it in a dry place in the shelter of the light and any impact of temperature. We sell currently 2 types of vanilla, a vanilla pod of Madagascar AOC Bourbon in its quality gourmet/ EXTRA and the vanilla pod of Tahiti. We propose the two vanilla in packaging economic, as freshness with pots in PET specially study to preserve the aromas of the small princesses. Buy the vanilla from Madagascar or of Tahiti, with the specialist of the import of the bourbon vanilla from Madagascar and Tahiti since April 2016, we propose udo exceptional quality and an unbeatable price. The best quality of the market. We ship the vanilla pods in a period of 24 hours after the passage of the command. It will require approximately 48 hours for a reception in France and a little less than a week for a reception in Europe. ( indicative source delivered by our carriers). Be on your purchases of vanilla, buy the vanilla pods of the world of the counter of Toamasina, we guarantee you the best vanilla pods of Madagascar as well as of Tahiti. You can come to remove your pod of vanilla from Madagascar or your vanilla pod of Tahiti Grand Cru, directly in our show room to Premesques, for this, it is enough for you to go command and select, remove the goods at the warehouse. (Available from 20 July). You can make an appointment or come in our opening hours. Lille is for a very long time a gastronomic city, Amatrice of Good Vanilla. Nicknamed the capital of Flanders, it at the crossroads of Europe. We await you on the market Sevastopol in Lille from 8h15 to 13h00 on Saturday and Sunday in the district of Vieux Lille from 8h15 to 13h00. We welcome you in our showroom at 12 rue des Alpes to Premesques. We will make you know a wide selection of vanilla from Madagascar and vanilla of Tahiti Grand Cru and our method to select the best pods. the best vanilla beans in the world There are 24 products.